Pluto (minor-planet designation 134340 Pluto) is the largest object in the Kuiper belt, and the tenth-most-massive body observed directly orbiting the Sun. It is the second-most-massive known dwarf planet, after Eris. Like other Kuiper-belt objects, Pluto is composed primarily of rock and ice and is relatively small, approximately one-sixth the mass of the Moon and one-third its volume. It has an eccentric and highly inclined orbit that takes it from 30 to 49 AU (4.4–7.4 billion km) from the Sun. This causes Pluto to periodically come closer to the Sun than Neptune, but an orbital resonance with Neptune prevents the bodies from colliding. In 2014 it was 32.6 AU from the Sun. The Pluto system: Pluto, Charon, Nix, Hydra, Kerberos, and Styx, taken by the Hubble Space Telescope in July 2012 - ...Pluto is also a member of a group of objects that orbit in a disc-like zone beyond the orbit of Neptune called the Kuiper Belt. This distant realm is populated with thousands of miniature icy worlds, which formed early in the history of our solar system. These icy, rocky bodies are called Kuiper Belt objects or w:Transneptunian objectstransneptunian objects. - National Aeronautics and Space Administration. Pluto was discovered in 1930. Pluto was long considered our solar system's ninth planet. But after the discovery of similar intriguing worlds deeper in the distant Kuiper Belt, icy Pluto was reclassified as a dwarf planet. This new class of worlds may offer some of the best evidence about the origins of our solar system. Pluto is also a member of a group of objects that orbit in a disc-like zone beyond the orbit of Neptune called the Kuiper Belt. This distant realm is populated with thousands of miniature icy worlds, which formed early in the history of our solar system. These icy, rocky bodies are called Kuiper Belt objects or w:Transneptunian objectstransneptunian objects. NASA's New Horizons will be the first spacecraft to visit Pluto and the Kuiper Belt. The spacecraft's nine and a half year journey to the ice dwarf began in January 2006. The spacecraft will reach Pluto in 2015. 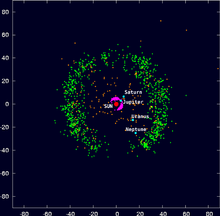 Plot of known Kuiper belt objects, set against the four gas giants. - Some facts about Pluto: Pluto is classified as a dwarf planet and is also a member of a group of objects that orbit in a disc-like zone beyond the orbit of Neptune called the Kuiper Belt.... -National Aeronautics and Space Administration. ...Pluto's 248-year-long elliptical orbit can take it as far as 49.3 astronomical units (AU) from the Sun. (One AU is the mean distance between Earth and the Sun: about 150 million km or 93 million miles.) From 1979 to 1999, Pluto was actually closer to the sun than Neptune, and in 1989, Pluto came to within 29.7 AU of the sun, providing rare opportunities to study this small, cold, distant world.... -National Aeronautics and Space Administration. Discovery images of Hydra (and Nix) - Pluto's moons are named for other mythological figures associated with the underworld. Charon is named for the river Styx boatman who ferries souls in the underworld; Nix is named for the mother of Charon, who is also the goddess of darkness and night; Hydra is named for the nine-headed serpent that guards the underworld;... -National Aeronautics and Space Administration. 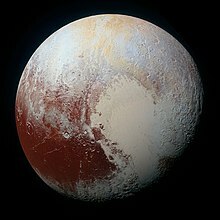 Some facts about Pluto: Pluto is classified as a dwarf planet and is also a member of a group of objects that orbit in a disc-like zone beyond the orbit of Neptune called the Kuiper Belt. This distant realm is populated with thousands of miniature icy worlds, which formed early in the history of our solar system. These icy, rocky bodies are called Kuiper Belt objects or transneptunian objects. Pluto is about two-thirds the diameter of Earth's moon and probably has a rocky core surrounded by a mantle of water ice. More exotic ices like methane and nitrogen frost coat its surface. Owing to its size and lower density, Pluto's mass is about one-sixth that of Earth's moon. Pluto is more massive than Ceres -- the dwarf planet that resides in the asteroid belt between Mars and Jupiter -- by a factor of 20. Pluto's 248-year-long elliptical orbit can take it as far as 49.3 astronomical units (AU) from the Sun. (One AU is the mean distance between Earth and the Sun: about 150 million km or 93 million miles.) From 1979 to 1999, Pluto was actually closer to the sun than Neptune, and in 1989, Pluto came to within 29.7 AU of the sun, providing rare opportunities to study this small, cold, distant world. Since its orbit is so elliptical, when Pluto is close to the Sun, its surface ices thaw, rise and temporarily form a thin atmosphere. Pluto's low gravity (about 6 percent of Earth's) causes the atmosphere to be much more extended in altitude than our planet's atmosphere. Pluto becomes much colder during the part of each orbit when it is traveling far away from the Sun. During this time, the bulk of the planet's atmosphere is thought to freeze. Pluto has a very large moon that is almost half its size named Charon, which was discovered in 1978. This moon is so big that Pluto and Charon are sometimes referred to as a double dwarf planet system. The distance between them is 19,640 km (12,200 miles). The Hubble Space Telescope photographed Pluto and Charon in 1994 when Pluto was about 30 AU from Earth. These photos showed that Charon is grayer than Pluto (which is red), indicating that they have different surface compositions and structure. Charon's orbit around Pluto takes 6.4 Earth days, and one Pluto rotation (a Pluto day) takes 6.4 Earth days. Charon neither rises nor sets, but hovers over the same spot on Pluto's surface, and the same side of Charon always faces Pluto -- this is called tidal locking. Compared with most of the planets and moons, the Pluto-Charon system is tipped on its side, like Uranus. Pluto's rotation is retrograde: it rotates backwards, from east to west (Uranus and Venus also have retrograde rotations). It isn't known whether Pluto has a magnetic field, but its small size and slow rotation suggest little or no magnetic field. Because Pluto and Charon are so small and far away, they are extremely difficult to observe from Earth. In the late 1980s, Pluto and Charon passed in front of each other repeatedly for several years. Observations of these rare events allowed astronomers to make rudimentary maps of each body showing areas of relative brightness and darkness. In 2005, scientists photographing Pluto with the Hubble Space Telescope in preparation for the New Horizons mission found two tiny moons orbiting in the same plane as Charon. These two moons, named Nix and Hydra, are two to three times farther away from Pluto than Charon. In 2011 and 2012, scientists used Hubble to spot two more moons (originally designated P4 and P5). In 2013, the two moons were named Kerberos (P4) and Styx (P5). Pluto is the only world named by an 11-year-old girl. In 1930, Venetia Burney of Oxford, England, suggested to her grandfather that the new discovery be named for the Roman god of the underworld. He forwarded the name to the Lowell Observatory and it was selected. Pluto's moons are named for other mythological figures associated with the underworld. Charon is named for the river Styx boatman who ferries souls in the underworld; Nix is named for the mother of Charon, who is also the goddess of darkness and night; Hydra is named for the nine-headed serpent that guards the underworld; Kerberos is named after the three-headed dog of Greek mythology; and Styx is named for the mythological river that separates the world of the living from the realm of the dead. At times during the course of Neptune's orbit, dwarf planet Pluto is actually closer to the Sun, and us, than Neptune. This is due to the unusual elliptical (egg) shape of Pluto's orbit. ...Pluto is only about twice the size of Charon, so if you put Pluto and Charon on the cosmic seesaw you would find that the balance point is a little bit outside Pluto, rather than inside it. Again, there is nothing particularly special going on there. If you were to find yourself at that precise spot, you would only notice that you were very, very cold and could no longer breathe. - Mike Brown . There is nothing particularly special about that location of the centre of mass. If you were to find yourself at the precise spot that is the centre of mass of the earth-moon system, the only thing unusual that you would notice is that there would be one thousand miles of rock on top of your head. Pluto is only about twice the size of Charon, so if you put Pluto and Charon on the cosmic seesaw you would find that the balance point is a little bit outside Pluto, rather than inside it. Again, there is nothing particularly special going on there. If you were to find yourself at that precise spot, you would only notice that you were very, very cold and could no longer breathe. The most common distinction made between the planets is “inner planets” versus outer “planets”. The term inner planets usually refers to the seven visual planets (although sometimes Jupiter and Saturn are not included in this list). This type of classification is very much a modern construct: before 1781, when Herschel discovered Uranus, there were only "inner" or "visible" planets—planets that were visible to the naked eye. (Of course the skies were a great deal clearer then). These included the Sun, Moon, Mercury, Venus, Mars, Jupiter, and Saturn. The outer planets are the planets that are only visible with a telescope: Uranus, Neptune and Pluto. The asteroid Chiron functions as a bridge between the inner and the outer planets....The fastest of the outer planets is Uranus which takes about 84 years to complete a cycle of the Zodiac. Today it is not unusual to see people to live past their Uranus return and humans are gradually developing a greater understanding of the energy of Uranus. During this time period, the discovery of the planet Uranus in 1781 caused a tremendous upset in the astrological community: this new planet forced the reevaluation of the entire system of Western astrology. Although Neptune’s and Pluto’s subsequent discoveries certainly caused stirs, Uranus was the planet that shook things up. The outer planets, which include Chiron, Uranus, Neptune, and Pluto, don't operate on an individual level the way the inner planets do, and they don't fit into the system of essential dignities. Uranus, Neptune, and Pluto spend so much time in each sign that they define the characteristics of entire generations, not of individuals. .... The first members of the "dwarf planet" category are Ceres, Pluto and 2003 UB313 (temporary name). -International Astronomical Union. The Solar System consists of eight "planets" Mercury, Venus, Earth,Mars, Jupiter, Saturn, Uranus and Neptune. A new distinct class of objects called "dwarf planets" exist. "Planets" and "dwarf planets" are two distinct classes of objects. The first members of the "dwarf planet" category are Ceres, Pluto and 2003 UB313 (temporary name). Where's my bed?!" Dairine shrieked. "It's on Pluto," Nita said. "On the winter side, somewhere nice and dark and quiet, where you won't find it if you look all day-which you're not going to have time to do, becaus you'll be in school. For historical and cultural reasons, Pluto should be a planet. Dr Owen Gingerich quoted by Jonathan O'Callaghan in: "Should Pluto be a planet again? Panel votes to reinstate ninth world of the solar system in unofficial debate"
We explore because we are human and we want to know. I hope that Pluto will help us on that journey. Stephen Hawking comments on photos of Pluto sent from New Horizons spacecraft on 13 July, 2013. In 2006, Pluto lost its status as a planet when other bodies in the solar system of similar or greater size were found. The decision to demote it to a ‘dwarf planet’ by the International Astronomical Union (IAU) at the time was highly contentious - and it now seems many still want its planet status reinstated.... - Jonathan O'Callaghan. In 2006, Pluto lost its status as a planet when other bodies in the solar system of similar or greater size were found. The decision to demote it to a ‘dwarf planet’ by the International Astronomical Union (IAU) at the time was highly contentious - and it now seems many still want its planet status reinstated. In a debate where experts presented cases for and against the decision, it was found that most people in the audience still wanted Pluto to be a planet... The latest vote isn't official, but highlights the public continued disapproval of Pluto's demotion to 'dwarf planet' status. However, if Pluto was still a planet it would cause a number of complications. Namely, several other bodies of a similar or greater size such as Ceres and Eris were found, and it is estimated there may be hundreds more Pluto-sized objects in the outer solar system. Reinstating Pluto, therefore, could ultimately lead to our solar system not being a small family of eight easily identifiable planets, but a complicated system of dozens of obscure worlds extending far beyond the orbit of Neptune. Jonathan O'Callaghan in: "Should Pluto be a planet again? Panel votes to reinstate ninth world of the solar system in unofficial debate"
Any lump of matter large enough to form a sphere around a star should be classified as a planet. Dr Dimitar Sasselov and Dr Gingerich quoted by Jonathan O'Callaghan in: "Should Pluto be a planet again? Panel votes to reinstate ninth world of the solar system in unofficial debate"
Of course, the music is absent a movement dedicated to Pluto, which had not yet been discovered, and it's missing Earth, which was not a classical planet, leaving a count of only seven. Shortly after Clyde Tombaugh's discovery, w:Gustav HolstHolst began working on a Pluto movement, inspired, of course, by themes of the underworld. From the late 1980s onward, the most popular planet mnemonic has been “My Very Educated Mother Just Served Us Nine Pizzas,” associating Pluto with pizza, a favorite food in America, especially among among schoolchildren. Pluto contains about 70 percent rock and 30 percent ice if you measure things by mass. But rock is denser than ice, leaving the rocky parts to occupy only 45 percent of Pluto's volume. Merlin has noticed over the years that many people would like to demote Pluto to an “–oid” status. But Pluto is twice the size of Ceres, the largest known asteroid, and 50 times the size of the largest comets. Computer-generated map of Pluto - … Pluto is a "dwarf planet" by the above definition and is recognized as the prototype of a new category of Trans-Neptunian Objects. - International Astronomical Union. (2) A "dwarf planet" is a celestial body that (a) is in orbit around the Sun, (b) has sufficient mass for its self-gravity to overcome rigid body forces so that it assumes a hydrostatic equilibrium (nearly round) shape,(c) has not cleared the neighbourhood around its orbit, and (d) is not a satellite. Although the definition may not have been very precise, it clearly categorized the bodies we knew at the time. In the 1990s, however, a remarkable series of discoveries made it untenable. Beyond the orbit of Neptune, astronomers found hundreds of icy worlds, some quite large, occupying a doughnut-shaped region called the Kuiper belt. Around scores of other stars, they found other planets, many of whose orbits look nothing like those in our solar system. They discovered brown dwarfs, which blur the distinction between planet and star. And they found planet like objects drifting alone in the darkness of interstellar space... Controversially, the new definition removes Pluto from the list of planets. Pluto should not be a planet as it had not cleared the path in its orbit - one of the prerequisites for a planet, as decided in 2006. Dr. Gareth Williams quoted by Jonathan O'Callaghan in: "Should Pluto be a planet again? Panel votes to reinstate ninth world of the solar system in unofficial debate"